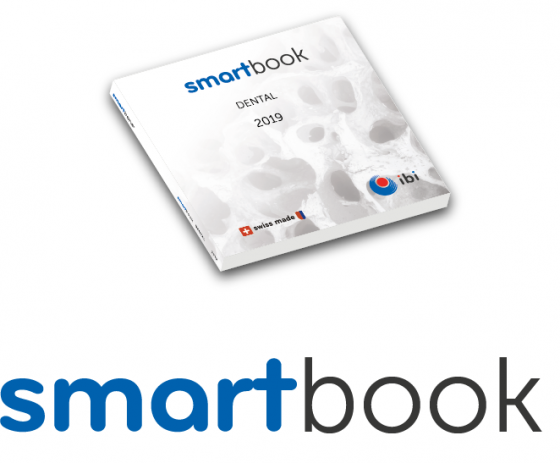 SmartBone is produced by combining natural bovine bone mineral structures with bioresorbable polymers and cell nutrients. This new concept of biomaterial assembly allows the patient’s cells to grow quickly and efficiently into SmartBone providing osteoconduction, osteogenesis and finally a perfect integration. SmartBone mimics the characteristics of a healthy human bone: high biocompatibility, adequate open porosity, high mechanical performance, hydrophilicity. 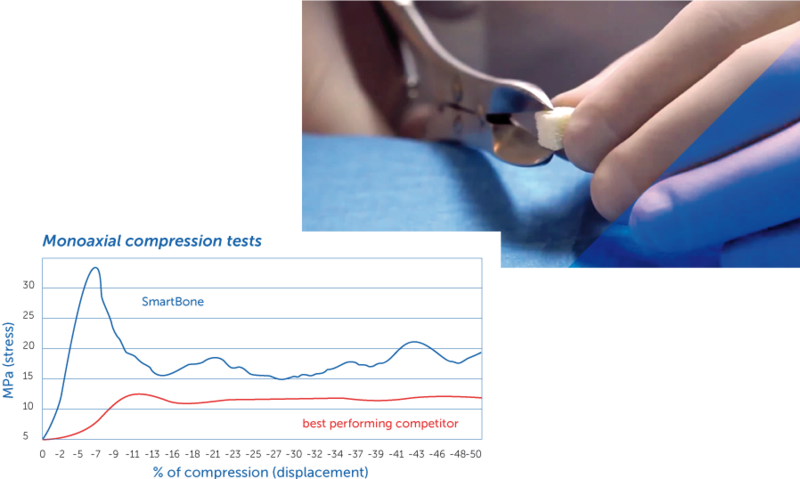 SmartBone was designed to reduce the inner variability that many other bone substitutes have, due to their natural origin. 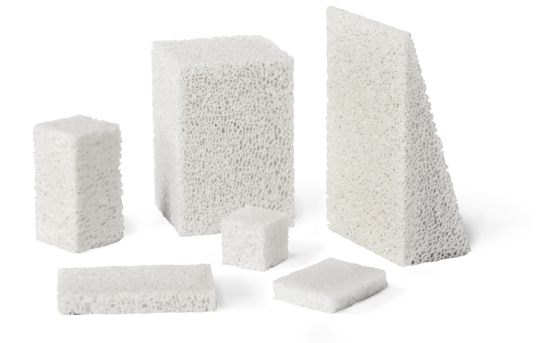 IBI offers homogeneous bone substitutes with regular microstructure, porosity, density and mechanical properties. Thanks to its microcomposition, SmartBone quickly reaches an av. 38%w/w blood swelling ratio, thereby sparkling the chemical signalling cascade that induces a robust osteointegration. 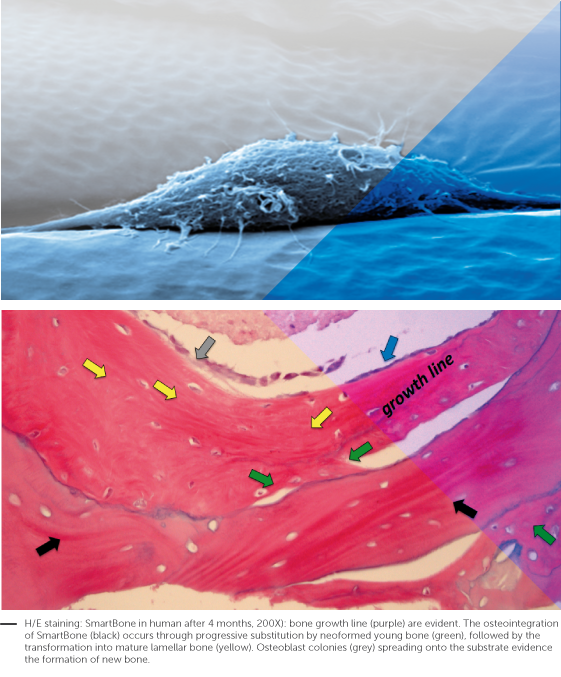 SmartBone’s microstructure and composition favors cell colonization. The electronic microscopy analyses of in vitro cell colonization tests evidenced the presence of wide and well-structured cell formations inside SmartBone, proving confirmation to the biochemical data collected during ISO standard in vitro tests.Biological and histological investigations showed how Smartbone is a very supportive substrate for cell adhesion and growth; HatMSCs showed in vitro capability to properly colonize the scaffold and, once induced, to differentiate. Studies were performed to assess osteointegration on a 4-month observation timeframe. Histological analysis proved confirmation of Smartbone integration, with natural bone formation and cells and vessels colonizing pores within it during time. high osteoinduction, conduction and integration? SmartBone is strong, easy to shape and resistant to screws…here’s the proof! We took a SmartBone block (10x10x10 mm) and harshly shaped it. We then drilled two holes at a very small distance. There is no powder formation, and the block doesn’t break into pieces! During a bone graft sugery we easily drilled a SmartBone block directly in place. The absence of powder formation helped the surgeon allowing to perform the drilling in situ! Furthermore, hydrophilicity is very high and the screws stay firmly in place.